The breed Hispano-Arabe receives it's name from the two breeds it originated from; namely the Spanish and the Arab. It's earliest conception as a breed in Andulusia dates back to the Muslim invasion of the Iberian Peninsular. In 1883 formal deliberate creation or selection for the breed in Spain started, partly as a result of the importation of Arabian horses specifically to upgrade and expand other horse breeding programmes (although there are some archive records showing earlier Hispano-Arabe breeding programmes as far back as 1778). From those early days to today despite its popularity as a working horse for the cattle men and military of Spain its expansion and consolidation as a breed has been slow. Part of this has been due to lack of quality of the stock produced in some of the earlier breeding lines. Another factor possibly influencing its slow expansion as a breed was the popularity of its own Thoroughbred part-bred; the Tres sangres "Three bloods" (Aha')/Anglo Hispano-Arabe' that was very much in demand by the military both as a Cavalry horse and sports horse and also greatly demanded by cattle breeders for working their livestock. With these factors and the increase in national and international demand for the Pure Raza Espanola(PRE), the Hispano-Arabe breed of horses were themselves dwindling in number and effectively by the mid 1980's a minority rare breed. 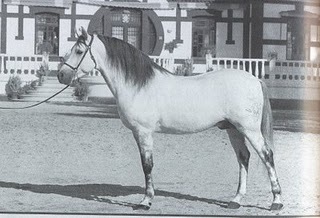 Thus in 1986 the Hispano-Arabe(Ha') was officially given consideration as a breed requiring "special protection" and consequently given their own Stud Book. In 1990 Spain the Cria (Spain's military unit specifically responsible for breeding/rearing young stock) started a number of strategies on military stud farms to conserve several indigenous breeds of equines and to aid the recovery and improvement of the Hispano-Arabe breed. As the numbers of Hispano-Arabe mares were very small an urgent breeding strategy was implemented to increase the number of Hispano-Arabe's being produced, using PRE and Pure Raza Arabian(Pra') mares to produce (F1) 50% generation Ha's and to try and obtain further established non military Hispano-Arabe mares of fixed phenotype to add other bloodlines to the programme. First: selection of stallions to be used; dividing their use between breeding selection stages lasting 4-5 years, revisable every 2yrs; and weighing up which stallions to cover the new mares. Second: define the aptitude tests that would be applied to the new generation of mares and stallions that allowed for the changes due to different breed types of the mares and stallions being used in the recovery programme, but would also be acceptable to the requirements of the Registration Book and subsequent valuation for grading and approval for breeding. From 1992 to the present day Spain's Plan for the recovery and improvement of the Hispano-Arabe breed has passed through three stages and currently nearing the end of it's fourth stage. Stage 1: (1992-1995) - is marked by the use of foundation Ha' stallions being bred with (F1)50% mares bred out of PRE dams x Pra' sires. Stage 2: (1996-1999)in this second stage five selected Pra' stallions were used to cover the Ha' mares and a PRE stallion selected to cover Pra' mares. Stage 3: (2000-2005)was dominated by the use of PRE horses for covering more than 80% of the Ha' mares. There was also a dedicated breeding programme to produce Ha' F1 stock from PRE mares being covered by both Pra' stallions and five new generation Ha' stallions of 50% and 75% ratios. (nb. for uninitiated; the %ratio refers to amount of Arab blood). One military herd of Pra' mares was also being covered by PRE stallions, as in the previous stage not many of this type of crossing had been produced. Alongside all these controlled breeding strategies some mares had been left to be freely covered by Hispano-Arabe stallions with the aim of producing quality F2 and F3 stock to progress and improve the breed. Stage 4: (2006-present day) has had to be designed to deal with the matured F2 stock with the percentages of Arab blood that previously was very difficult to find in the Hispano-Arabe horses; such as 62.5% and 37.5%, and is an occurrence of the breeding stages involving foundation lines of Ha's and natural progression of outbreeding 25% and 75% Ha' stock to PRE and Pra'. (Nb. having the only foundation Ha' breding programme in the UK, I am in the same stage of dealing with this annomaly). The stock produced from breeding Ha' stallions and Ha' mares of these ratios to each other will be 50:50. The second strategy of the Military Plan for the breeds recovery and improvement was looking at defining tests to evaluate the qualities in the Hispano-Arabe stock being produced through this programme to ensure that they reflected the breed standard. In the early years the Military Training Centres applied the same tests to the Hispano-Arabe as they were devising for the Anglo-Arabe(Aa') another breed project they were working on. After several years gaining experience, a different set of tests were devised for the Hispano-Arabe assessing them as they grew, through early training/backing and through a complete range of classical ridden work. When a young 50% Ha' stallion Ultaje proved himself qualifying and competing in tests for ANCADES (Asociacion Nacional por Caballos Desportes, ie Spanish Sports Horse Association**) testing young horses in a complete test of all around riding skills, and obtained very promising results, the Military modified their initial strategy. Now future stallions will have a duty to demonstrate that they do pass their traditional quality and qualities on to their offspring in the same way other breeds do, without in principle resigning the horse to any particular equine discipline. In effect the Hispano-Arabe is to retain the qualities that made it a versatile working horse show apptitude to become an all round sports horse. In this respect the Cria has continued a project they started in about 2006 in collaboration with several military horse farms to compare the Hispano-Arabe stallions in recruitment for sports competition. At the time that Commander Lopez produced his article on the recovery programme he noted that the Hispano-Arabe stallion Rela'mpago from Jerez was already involved in a career as a competition sports horse. It is important to note that alongside this strategic Plan for the recovery and improvement of the Hispano-Arabe, exists the premise year after year that all the decisions taken by the Technical advisory Board (Junta) regarding the military stud farm mares is by necessity a "Drastic Selection" process. Apart from helping in the recovery of a breed the studs involved in the programme must determine the Hispano-Arabe model that will be present in any horses of the breed produced elsewhere. The implication is that, in future the selection of stallions and mares will become far more demanding. 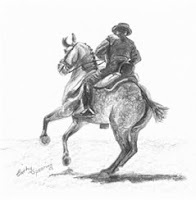 The original article Commander Lopez wrote was aimed at and taking consideration of the Spanish Hispano-Arabe breeders; predominantly the ranchers and cattlemen for whom this breed is so vital. 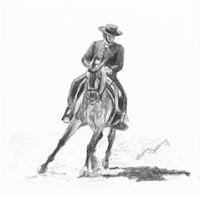 He noted that the requirements of the military for an exceptional sports horse exhibiting beauty and distinction as well as the greater bone development and seriousness for the competition discipline had to coexist with the requirements of the stock men for a horse of great nobility that makes daily handling pleasant, without being sluggish, the requirement for a comfortable ride, a good mouth, endurance/stamina and a great capacity for learning. His article concluded with a postscript referring to the important changes affecting the Cria Caballar in Spain (this would be in reference to the changes we have seen regarding the PRE) and the importance of cattle ranchers to become pro-active in promoting the reputation of the breed, and to take serious measures to recreate the breeding stages for their Hispano-Arabe mares such as that started by the Cria in its Plan. He exhorts the ranchers to likewise evaluate their resultant stock and do as much as possible to expand the Hispano-Arabe breed. At the moment in Spain there are many changes occurring affecting the PRE and causing great uncertainty regarding the future registration of those horses here in the UK. The possibility of the same changes coming into play over the Hispano-Arabe when it is still so vulnerable is the reason for the cattle ranchers in Spain taking a more active step towards expanding the conservation plan that was already in progress. It should also be noted that when the Cria (or any other organisation; should/when the Cria at any time ceases pro-active involvement with the breed) consider that Spain has restored the Hispano-Arabe population and breed type to a secure path of breed development, the measures of introducing permissible PRE and Pra' breeding to improve and expand the Ha' population could well be removed altogether or retained on a controlled basis much like the Lipizzaner studs retain a controlled use of PRE stallions. The Hispano-Arabe is a breed in it's own right formerly recognised world wide and given special consideration for protection, hence the concerted efforts of Spain to implement an expanded breeding programme involving reintroduction of Pure Spanish and Arabian bloodlines in an effort to drag the breed back from the edge of extinction! In the years that Spain has worked hard to promote and save this breed, the Cria has tirelessly visited the UK to ensure our Hispano-Arabe horses were not lost from the greater Plan to expand and protect the breed. Sadly many of the horses they approved and graded in the hope of saving the breed have been lost through failure of their owners to help in continuing with constructive breeding of their horses. Even today with the benefit of Calificado approval for AI to help with next generation (F2) breeding, it appears their plea for help in the preservation of the Hispano-Arabe as a breed is falling upon deaf ears. It is sincerely hoped that with this article bringing home the plight of the Hispano-Arabe breed and the desperate work that the Cria embarked upon to save it from extinction that those of you in this country involved as owners or breeders will come to appreciate that what you do now will significantly impact upon the future of the breed as a whole. ** As I finish translation and interpretation of Commander Lopez manuscript events in Spain have already led to changes regarding the Hispano-Arabe. The Hispano-Arabe has officially been designated to ANCADES the Spanish Sports Horse Association as a Sports Horse and UEGHa' (The Spanish Union of Cattle Dealers of PRHa')has officially taken over from the Cria Caballar the control of the Hispano-Arabe Stud Book. Future assessment of our Hispano-Arabe horses will be very similar to that of the UK sports horse. Please contact me if you are interested in the formation of an independent UK breed society for your Hispano-Arabe . Do you Own or Breed a Hispano-Arabe ? of the Pure Raza Hispano-Arabe in Britain. Before venturing down the road to unite the Hispano-Arabe fraternity to work for the good of the breed there are many issues festering in the background, and while it is not appropriate or constructive to catalogue them it is perhaps important that the existence of grievances be acknowledged in order for the past to be laid to rest. As its title states the British Association for the Pure Bred Spanish Horse was set up in the early 1980's for the Pure Bred Spanish Horse. The members who struggled and worked to forge the links with Spanish and British officialdom in order to bring about the organisation that exists today were doing so for the breed of horse they felt passionately about. They were not in those early days expecting to have another breed of Spanish horse quite literally thrust into their midst. When I came onto the scene in 1985 with Piyayo a Hispano-Arabe stallion from Spain, the fledgling society did not know what he was. Other than defining him as 'just another part-bred' they had no reason to believe that the Hispano-Arabe would become another equine requiring as much commitment from them as their own much loved PRE. Unbeknown to them, Spain was in the very process of taking action to officially set in motion its own agenda for the protection and promotion of the Hispano-Arabe. The Spanish Government Ministry of Environment for Rural and Marine Affairs registered the Hispano-Arabe in its official records of livestock in the group of National Breeds in Danger of Extinction. In the USA where the Hispano-Arabe has for generations been in working use as a cattle stock horse, the plea for help in protecting the breed was headed and wholeheartedly responded to with the establishment of PRHa' Association to meet the requirements of the Cria. In 1986 the BAPSH rose to the occasion of trying to take under its wing the Hispano-Arabe and all the added demands of juggling extra paperwork and officialdom that came as part of the trappings of handling a foreign breed. Sadly from the outset whether by failure of understanding and communication problems it was never truly grasped by the association committee of that time that the Hispano-Arabe was in fact a breed in its own right with special breeding concessions being put in place as part of a bigger National programme to save the breed. Any search of the inter-net will show the repeated misconception by both PRE and Ha' studs here that this is nothing more than a cross-bred or part bred of the PRE. That error and perhaps a shadow of discontent at the demands for assistance from the Hispano-Arabe members has as much as anything over the years been a constant knife of disharmony and it is, unfortunately, the horse or more specifically the breed protection and recovery programme that has suffered. Over the years I have received many phone calls from Hispano-Arabe owners frustrated at perceived and/or actual slights to their breed or failures by the society to 'do what it says on the bottle'! The fact is the society has fulfilled its obligations to the breed for which it was founded; the PRE, and gone beyond that in stretching itself albeit with the wrong conception to provide for what it has believed was simply a cross breed aspiring to new status as a breed. For their part the Hispano-Arabe members even when misinformed about what exactly they were breeding (ie it is a breed in its own right and not a part-bred/cross-bred) needed to have the sense to understand the Hispano-Arabe is not in any way a PRE, it has a totally different commercial and financial value and should be trained and bred and sold with consideration for what the Hispano-Arabe can do and not as in so many cases be produced with a belief that it will train and 'retail' in the high end market on a par with the PRE. In short, yes, there has been horrendous unnecessary problems all around in the management and representation of the Hispano-Arabe in this country. I point this fact out simply so that we can move forward without bitterness or recrimination. The BAPSH has grown significantly since its beginnings and the members that work to maintain this society do so rightly for the PRE. Apart from the successful promotion and expansion of these horses here, changes in Spain regarding the registration and management of the PRE have already resulted in added work for the committee. The impact to the Hispano-Arabe owners is the question of future assessment and grading now that the society has had to transfer its links to new organisations in Spain for the PRE. However at this point in time the Cria is still very much involved in continuing the conservation Plan they have committed themselves to, which means in the interest of the breed they will endeavour to continue assessing and grading our horses and the BAPSH will work to assist in facilitating this requirement despite it being a logistic burden impacting on their commitment to the PRE members. But, are we, the Hispano-Arabe owners/breeders for our part prepared to seriously work for the preservation and expansion of the breed through a concerted effort to co-operate in constructively promoting and expanding the breed. Taking account of the fact that management of the two breeds for registration and grading in Spain has now more than ever before diversified into very different 'camps', it is only to be expected that the logistics for the society has reached a point where it must seriously consider the viability of continuing to tie the two breeds in one association. For now I am looking at working with and within the BAPSH structure to provide an independent registrar and liaison for the Hispano-Arabe horses. If there is a serious interest from the Hispano-Arabe members to now join Spain fully in its commitment to preserve and promote the breed and to promote its breeding and use in the present day to ensure the long term health of the breed, we can with the the guidance and experience of the BAPSH take the steady steps to establish our own association for the Hispano-Arabe. Over the next months I will be producing articles aimed at facilitating a better understanding of the Hispano-Arabe as a Breed in order to help potential breeders and owners. In some cases these will be derived from translations of articles produced in Spain in their official promotion for the protection and expansion of the Hispano-Arabe breed. As I go to 'press' with the opening of this blog changes I suspected to happen, have. The Cria Caballar no longer manages the Hispano-Arabe Stud Book. This breed has now been designated as a Sports Horse under the rules of ANCADES the Spanish Sports Horse Association and the Stud Book handed to the custody of UEGHa' The Spanish Union of Cattle Dealers of PRHa'.